Black Dragon updated to version 3.4.1 on January 25th – release notes. Kokua updated to version 6.0.1.44619 (RLV) and version 6.0.1.44611 (non-RLV), January 26th – release notes. Restrained Love Viewer updated to version 2.9.25.1 on January 26 – release notes. Cool VL updated to version 1.26.22.32 on January 26th – release notes. Update – and Ouch! Within 24 hours of posting this, Willow Spring Ranch has been taken down! SLurls removed as a result. Once again we’ve been drawn to a region on the recommendation of Shakespeare and Max. Willow Spring Ranch is offered as a place for couples and friends to visit, explore and enjoy. A rugged setting, this Homestead region presents a rich landscape surrounded by tall, green mountains and water. Designed by Gazza Tremor on behalf of region holder Brandi Darkwatch (Brandi Wycliffe), it’s a place blending multiple activities. Trails wind through the landscape, offering a route of exploration across both the high plateaus and the low-lying regions such as the beach. These can be followed on foot or – if you have a wearable horse – can be ridden (horse riding is expressly encouraged in the region). As well as riding and walking, the region offers several places for dancing – most notably a large deck towards the west side of the region, overlooking the seas below. Games are also on offer, particularly down on the pier that brackets one side of the region’s beach. For those who don’t fancy walking, the path north from the landing point leads to a bridge and, beyond it, a barn. Outside of this (among other things) is a bicycle rezzer – although I confess both Caitlyn and I found the winding paths alongside the barn and crossing the rest of that plateau difficult to navigate from the bicycle saddle! With its open spaces, lack of buildings, its woodlands and lowlands, Willow Spring Ranch is a little different to many of the public regions usually found in Second Life. The design of the paths and trails lead the way around the region in such a way as to give the impression this is a park covering a large area, the paths naturally offering a way around it in such a manner that adds to the feeling the region is larger than is the case. If you do have a wearable horse (or similar) for riding, Willow Spring Ranch might be a very worthwhile visit; but even if you are on foot, the region offers a lot to see and opportunities for a little outdoor relaxation, be it dancing or just sitting and talking. There’s even the option for 10-pin bowling! Now open at Artful Expressions Gallery is a small, untitled exhibition of Second Life photographs by Justine Here (Justherforpix). Small though it might be, it is also a marvellous introduction to a photographer who – so I understand from talking to the Gallery’s curator, Sorcha Sanvean (Sorcha Tyles) – is unsure of her work. I’m not sure why; Justine has a remarkable eye for photographic composition and expression within our digital world. Her skill is perfectly expressed in the six images offered for this exhibition. A mix of avatar studies and landscape images, each and every one of them is utterly exquisite. I’m often prone to discussing pictures in terms of the narrative they offer; I’m naturally drawn to doing so as words and expression drive me. Sometimes that narrative is rich, at others it is subtle. In these pieces it is simply extraordinary. Untitled, each piece naturally draws the eye and the imagination into seeing and telling a story about the moment in time – the moment in life so perfectly captured and framed with each. And I do mean life; all six pieces breathe its very essence through their composition: the use of light, colour, tones, focus, depth. Similarly, the level of emotion conveyed in each piece is magnificent. These are not pictures simply to be seen; they offer themselves as works to be seen; they are images to be tasted and savoured; the stories within them to be experienced. As such, I’ll say no more here – but I will urge you to go and see for yourself. This is a small, but truly elegant exhibition. I’ve written a lot about Planet Nine, the mysterious, yet-to-be-discovered world thought to be orbiting far out in the hinterlands of the solar system, and potentially responsible for the odd orbits of a number of bodies in the Kuiper Belt (referred to as Kuiper Belt Objects, or KBOs). Most recently – in June 2018 – I noted that one field of research suggested that while gravity could be responsible for the eccentric orbits seen with many KBOs, it might not have anything to do with the presence of another planet. Now a new study – Shepherding In A Self-Gravitating Disk Of Trans-Neptunian Objects – further casts doubt on – but does not eliminate – the need for any planetary object being responsible for the odd orbits of Sedna and the other unusual KBOs. In it Professor Jihad Touma, from the American University of Beirut, and Antranik Sefilian, a PhD student in Cambridge’s Department of Applied Mathematics and Theoretical Physics, suggest a disc of icy material could be the cause. 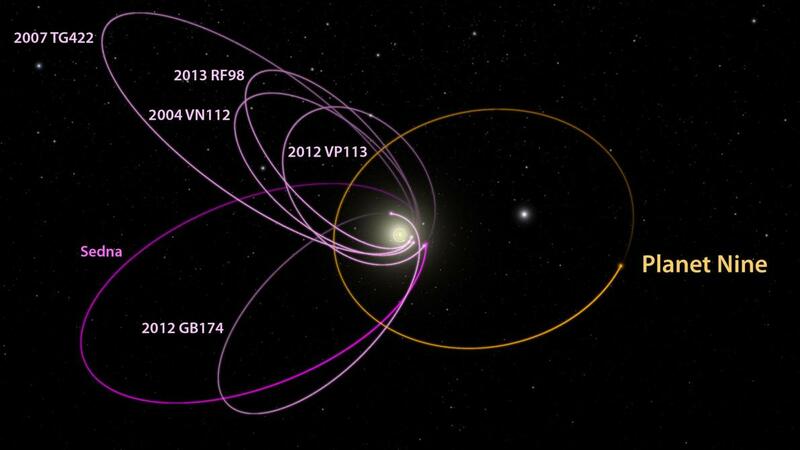 The attraction for there being a planet responsible for teasing these objects into the odd orbits is that over the last 15 years, some 30 Trans-Neptunal Objects (TNOs) have been discovered in highly-elliptical orbits, all of which would appear to a large planetary object having some form of influence on them. However, despite extensive attempts to locate this mysterious body, possibly the size of Neptune, it has remained elusive – possibly because it doesn’t exist. 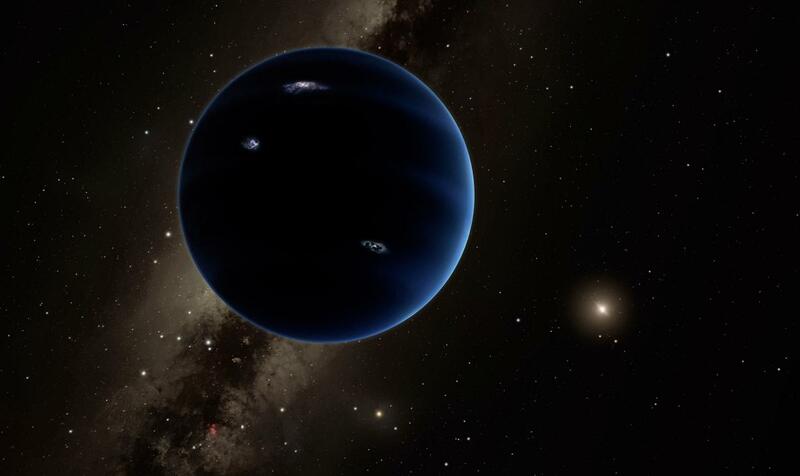 The Planet Nine hypothesis is a fascinating one, but if the hypothesised ninth planet exists, it has so far avoided detection. We wanted to see whether there could be another, less dramatic and perhaps more natural, cause for the unusual orbits we see in some TNOs. We thought, rather than allowing for a ninth planet, and then worry about its formation and unusual orbit, why not simply account for the gravity of small objects constituting a disc beyond the orbit of Neptune and see what it does for us? Instead, he and Touma modelled the full spatial dynamics of TNOs, taking into consideration the influence of the known giant outer planets in the solar system and a massive, extended disc of material beyond Neptune. Their results suggest that such a large – if yet-to-be-discovered – disc of material were to be orbiting the Sun at a great distance, it could give rise to TNOs occupying highly elliptical and exaggerated orbits around the Sun. In addition, they were able to model mass ranges and shapes for the icy disc and demonstrate how gradual shifts in its precession rate, could give rise to the wilder orbits seen with the 30+ eccentric TNOs. If you remove planet nine from the model and instead allow for lots of small objects scattered across a wide area, collective attractions between those objects could just as easily account for the eccentric orbits we see in some TNOs. However, there is a problem with the theory – or two issues at this point in time. The first is that, like Planet Nine itself, it’s one things developing a computer model that demonstrates of a disc of distant material can influence TNOs and drive them into strange orbits, it is quite another to physically find it. The second is that attempts thus far made to estimate the mass of icy objects beyond Neptune have only added up to about one-tenth the mass of Earth – which is far too little to have any significant influence over TNOs. Part of the problem here is that as we’re inside the disc and looking out at it, it is incredible hard to sport the material that might be a part of it – something which Sefilian and Touma acknowledge. But there is more than enough evidence found around other solar systems to suggest extended discs of icy material are actually quite commonplace, and so one could well by surrounding our own. What’s required is a longer, more considered look and the space around us – something that may well take time. And even then, Touma and Sefilian acknowledge that while their study suggests there is no need for any mystery planet, the hunt for Planet Nine shouldn’t be entirely abandoned; it might be that both it and a distant icy disc of objects might be responsible for the “rogue” TNO orbits far outside the plane of the ecliptic. On January 25th, 2019 NASA and John Hopkins University revealed the most stunning picture of Ultima Thule thus far returned by the New Horizons mission as it flew by the Kuiper Belt object (KBO) on January 1st, 2019. Obtained with the wide-angle Multicolor Visible Imaging Camera (MVIC) the image was captured when New Horizons was just 7 minutes from its point of closest approach to the KBO, and just 6,700 km (4,200 mi) from it. With an original resolution of 440 feet (135 meters) per pixel, the image was stored in the spacecraft’s data memory and transmitted to Earth on January 18th/19th, where it went through a process designed to sharpen the image and enhance fine detail. The oblique lighting of this image reveals new topographic details along the terminator, near the top. These details include numerous small pits up to about 0.7 km (0.4 mi) in diameter. The large circular feature, about 7 km (4 mi) across on the smaller of the two lobes, also appears to be a deep depression. It’s currently unclear whether these pits are impact craters or features resulting from other processes, such as “collapse pits” or the ancient venting of volatile materials. This new image is starting to reveal differences in the geologic character of the two lobes of Ultima Thule, and is presenting us with new mysteries as well. 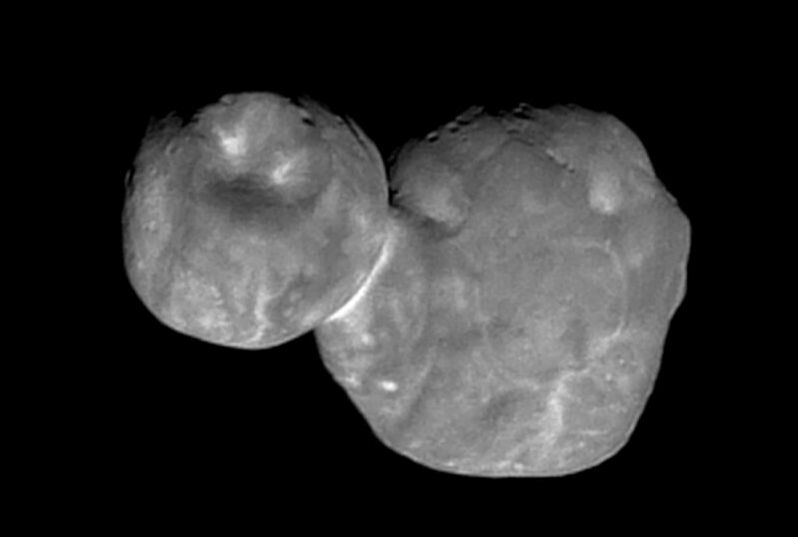 Over the next month there will be better colour and better resolution images that we hope will help unravel the many mysteries of Ultima Thule.